NOW with exclusive Two-Speed Axle! Just one year ago, Simplicity startled the power garden industry with this new look in riding power units. The Wonder-Boy was new, revolutionary . . . an exciting step forward. But even then, people saw in it the answer to their lawn needs. 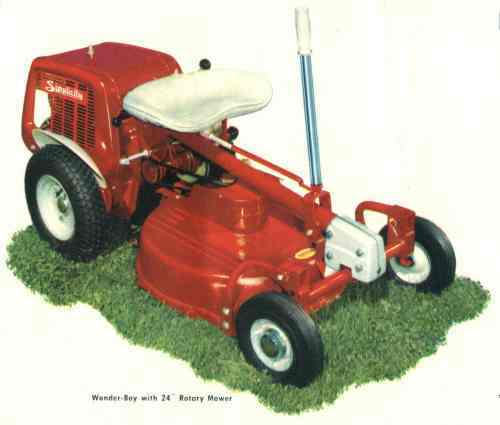 Today, Wonder-Boy is a proven-performer, owned and enjoyed by thousands of Americans. Young and old alike have found it the last word -- simple to use, comfortable, safe and a trouble-free performer. Wonder-Boy has, literally, changed the lawn maintenance habits of America. With it, you can mow lawns to golf-green smoothness without scalping . . . mulch leaves . . . haul heavy loads . . . roll lawns . . . grade . . . plow snow! Its rear-mounted engine puts heat and fumes behind you . . . its simple Joy Stick control brings smooth, instant response . . . and its exclusive Two-Speed Axle provides high and low speeds. Try Wonder-Boy yourself. A few minutes aboard and you'll want this riding power unit on your grounds -- city or country. For no other unit can do so much for you . . . so quickly and so well. Engine: 4 cycle, 4 HP, single cylinder, air cooled heavy duty cast iron. Recoil starter. Clutches: Simplicity "soft action," spring loaded idlers. Conveniently located controls. Axles: "Duomatic" Two Speed Rear Axle, exclusive planetary design has two speeds forward and reverse. Truck type differential. Front axle "floats" 8" horizontally -- 16" vertically. Steering: Complete control of unit concentrated in single "Joy Stick." Safety spring-loaded front wheel spindles. Ball joint suspension on steering rods for ease of handling. Tires: Fully pneumatic, knob traction tires, 4.00 x 8, 2 ply, steel disc wheels. Optional Equipment: 12 Volt electric starter with 20 amp. hr. 12-volt battery.